Poetry Friday... on Poetry Friday! 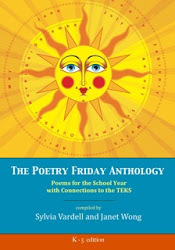 I'm long overdue in posting here about the remarkable Poetry Friday Anthology - a collection of poems and curricular connections put together by Janet Wong and Sylvia Vardell. You should own a copy whether you're teacher, student, parent or poetry lover. I don't say that just because I have two poems in the anthology. I say that because it's flat out great reading (not to mention perfect for schools). Plus, the poets who contributed are an utterly remarkable lot (and I am kinda giddy to find myself mixed in among them). I could go on, but for an incredible glimpse of what's inside (and why), I want to send you over to an amazing post on Renee LaTulippe's blog. (Bonus fun is that it's a Poetry Monday post about Poetry Friday which I send you to on a Friday). Speaking of which... this week's Poetry Friday roundup is over at TeacherDance today. I hope you enjoy it and the anthology, too! Yes, it's that time of year again - nominations for the Cybils are open til October 15th. Follow the link to go nominate your favorite books of the year. All the possible categories are in the sidebar (right now you have to scroll down a bit to see 'em) and they range from book apps to poetry to graphic novels to YA. Go on, now. Join the fun! This is a video of author (and ukelele player, obviously!) Mike Jung at the official book launch for his debut novel Geeks, Girls, and Secret Identities. You won't see me do this at my launch... but that's only cuz I can neither sing or play like he can. If I could, I'd ask him for the rights to this song in a heartbeat. Go buy his book. I mean, if you like seriously funny middle grade stuff and all. Or if you just want to help him get new pants.